The second Sheffield derby of the Championship season between Wednesday and United ended goalless at a wet Hillsborough. 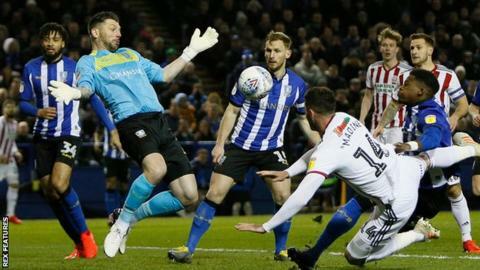 A third consecutive stalemate between the two city rivals left the Blades third, two points behind second-placed Leeds, while the Owls are six points off the play-offs. A competitive first half yielded only one effort on target - Blades striker Gary Madine's close-range header, which Keiren Westwood kept out at his near post. However, the best chance of the game fell after the break to Wednesday midfielder Sam Hutchinson, who timed his run perfectly to get onto the end of Rolando Aarons' low cross, but he could only divert his shot straight at United goalkeeper Dean Henderson. Henderson had earlier made a diving save to deny winger Aarons on his way to registering a fourth successive clean sheet. The Blades looked most likely to find a breakthrough in the closing stages but a series of set-pieces amounted to little in the way of attempts at goal. Wednesday, who climbed a place to 13th in the Championship, are unbeaten in seven league matches since Steve Bruce took charge at the start of February. Sheffield Wednesday boss Steve Bruce told BBC Radio Sheffield: "Both teams didn't want to lose and it's always the same in a derby game in my experience. "That little bit of quality [for the Hutchinson chance] was the only bit we showed. Rolando got free and put a wonderful cross in. I think it was John Egan who left it alone, which confused Sam really. "He's disappointed because it was the best opportunity of the game. They were few and far between." Sheffield United boss Chris Wilder told BBC Radio Sheffield: "It was a very bitty game that was littered with fouls from both sides. It never got going. "We take a point and move on. We had a great chance in the first half and they had one in the second when Dean made a good save for us. "It was a fair result. I thought both teams defended really well against set-pieces but from a control point of view we just didn't do it. "They've got good players and an outstanding manager so this was always going to be a difficult game." Match ends, Sheffield Wednesday 0, Sheffield United 0. Second Half ends, Sheffield Wednesday 0, Sheffield United 0. Attempt missed. Rolando Aarons (Sheffield Wednesday) left footed shot from outside the box is just a bit too high. Assisted by Michael Hector with a headed pass. Tom Lees (Sheffield Wednesday) wins a free kick on the right wing. Offside, Sheffield United. Dean Henderson tries a through ball, but Billy Sharp is caught offside. Offside, Sheffield Wednesday. Adam Reach tries a through ball, but George Boyd is caught offside. Attempt blocked. Steven Fletcher (Sheffield Wednesday) left footed shot from outside the box is blocked. Offside, Sheffield United. Enda Stevens tries a through ball, but Billy Sharp is caught offside. Attempt blocked. John Egan (Sheffield United) header from the centre of the box is blocked. Assisted by Oliver Norwood with a cross. Corner, Sheffield United. Conceded by Liam Palmer. Corner, Sheffield United. Conceded by Michael Hector. Attempt blocked. Martin Cranie (Sheffield United) left footed shot from the right side of the box is blocked. Assisted by Kieron Freeman. Substitution, Sheffield Wednesday. Morgan Fox replaces Dominic Iorfa. Corner, Sheffield United. Conceded by Keiren Westwood. Attempt missed. John Fleck (Sheffield United) left footed shot from outside the box misses to the right. Assisted by David McGoldrick. Substitution, Sheffield United. David McGoldrick replaces Gary Madine. Attempt missed. Liam Palmer (Sheffield Wednesday) right footed shot from outside the box is too high. Assisted by Barry Bannan. Attempt saved. Sam Hutchinson (Sheffield Wednesday) right footed shot from the centre of the box is saved in the centre of the goal. Assisted by Rolando Aarons with a cross. Substitution, Sheffield United. Martin Cranie replaces Kieran Dowell.